How does it work, and what does it do? RealTraffic consolidates data from multiple international ADS-B and multilateration networks to obtain information about other airplanes near the position of your (simulated) aircraft – in realtime, live! Depending on which simulator you are flying, it then injects this traffic so you can fly with it, or follow it. 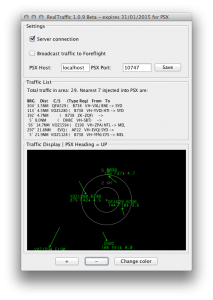 FSX/P3D Fully supported including traffic injection using the PSXSeeconTraffic add-on. Aerowinx PSX Fully supported natively. Allows injection of up to 7 aircraft (PSX limitation). 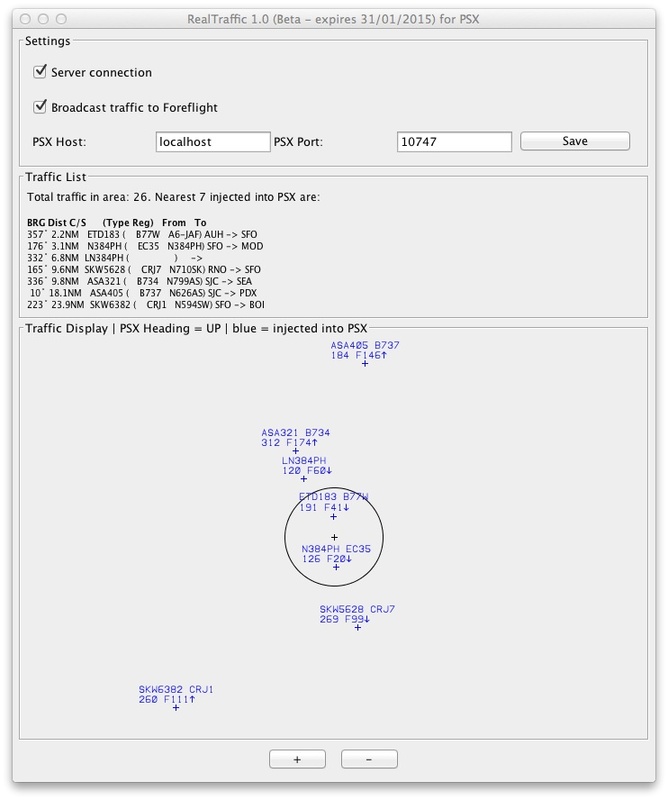 Traffic is shown both in the windshield and the TCAS system. X-Plane Supported as position source only – useful for visualising traffic in conjunction with e.g. Foreflight which shows position/attitude of the X-Plane simulator as well as the real traffic. Spotter Mode Manually select your position from the airport list or enter latitude/longitude manually. Don’t use this mode if you’re flying with a simulator, as obviously RealTraffic will not follow your position. New spotter mode as of 5.0.25: You can now use RealTraffic to display air traffic in any area you manually enter – either by selecting an airport, or by manually entering the latitude/longitude of the point of interest. This will broadcast traffic on the network in the same way as if you were running a simulator. 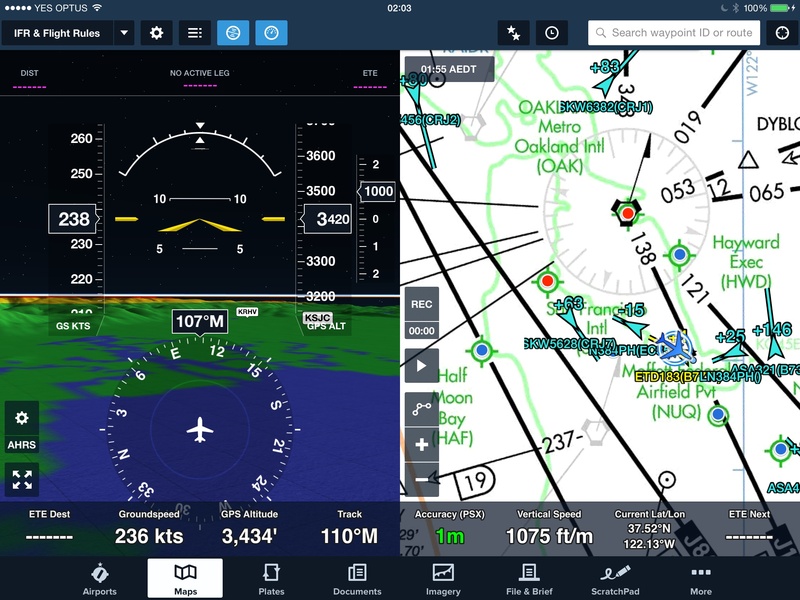 This allows you to view traffic in third party EFB apps such as Foreflight without the overhead of having to run the full flight simulator software. If you want traffic to be available wherever your simulator is however, you should not use spotter mode, as traffic is only displayed in a 100 NM radius around the current position. Please download the software and test whether it does what you want it to prior to purchasing a license. During the demonstration time the software is fully functional! If it doesn’t work during the demo, it won’t work after purchasing a license! If you want to use the RealTraffic software for more than 3 x 5 minutes every 24 hours, please purchase a license. You will instantly receive your license via email sent to the email address registered with PayPal! Almost all licenses are issued within less than a minute of PayPal accepting payment. If it’s not there, check your spam folder, the sender of the license email is sales@inside.net. The license is issued and sent to your email address registered with PayPal. Make sure you can receive email on that address. Check your spam box. If one hour after the order you have not received the license, please email sales@inside.net with your PayPal receipt and we will work on issuing a license manually. You are acquiring a time limited license to the software, NOT the traffic data! Traffic data is provided on a best effort basis and cannot be guaranteed to be up to date or available at all times! This brief PDF document explains how to interface RealTraffic so you can make use of traffic whichever way you would like to. Click here to download the document. Firstly, please remember that RealTraffic only works natively with the PSX 747-400 flight simulator software. 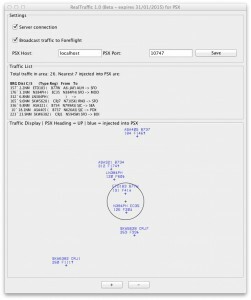 If you are using FSX or P3D, you are using Nico’s PSXseeconTraffic addon – and whatever problem you’re having most likely originates in that corner of the universe. Please check out his forum here if that’s the case: https://www.avsim.com/forums/forum/819-psxseecontraffic-for-fsx-p3d/. If you still think there is a problem with RealTraffic and it doesn’t behave as expected, follow these few simple steps to help with debugging. RealTraffic has been shown to run on thousands of computer configurations without problems. It’s been tested on Windows 7/8/10, OS X, and Linux. Remove any equipment from your network that might be trying to put itself inbetween your computer and the internet. This can result in security exceptions and the connection won’t succeed, preventing RealTraffic from running. There are for example free internet deals in the US where marketing firms will sniff your internet behaviour by injecting themselves between your computer and the servers you’re retrieving data from, in return for free internet. This won’t fly, literally, with RealTraffic. To see whether the server RealTraffic needs to be able to access to run is reachable, try connecting your browser to the RealTraffic status page https://secure.inside.net/RealTraffic/ on the same computer as RealTraffic is running on. If you can’t connect, the problem is network related. Check your internet connection and your DNS settings. If the problems still persist, try downloading the “standalone” version as it includes all of the required runtime libraries and will run independently of your locally installed Java Runtime Environment (JRE). Finally, make sure you have all the software bits and bobs connected. RealTraffic is completely “add-on” agnostic – it doesn’t know whom it is talking to on the server port, whether that’s PSX, PSXSeeconTraffic, X-Plane, or another third party app. Make sure they are indeed providing the data RealTraffic needs to function. If issues persist, start RealTraffic in debugging mode from the command line. This can help you locate problems with your installation. On Windows, simply open a terminal/console, change into the directory the software is located in, and run the following command java -jar RealTraffic.exe debug and watch the console for debugging output. if you’re running the standalone version, use this command: java -jar "RealTraffic Standalone.exe" debug. Make sure to include that output in any support email you might send. 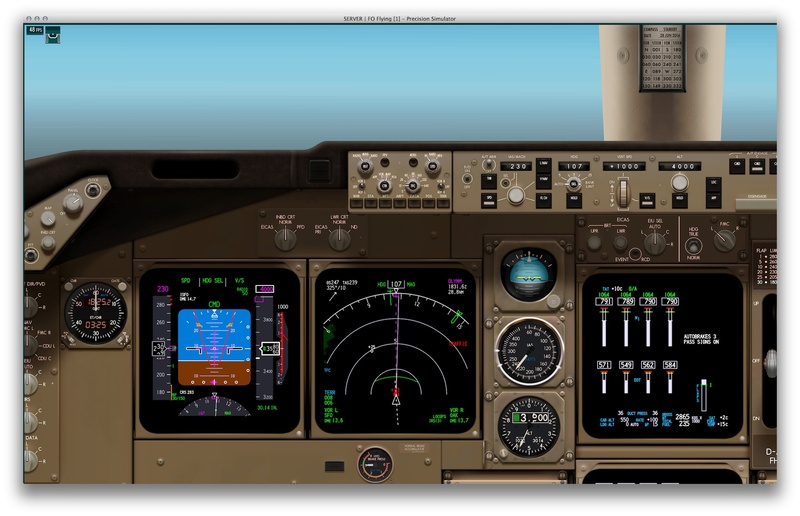 In descent towards Paris, compare the RealTraffic screen on the right hand side with the TCAS display: at the 10’o’clock position, LDM25JV is visible, a 737-800 that’s approximately 300ft above us and in descent. EWG1182 at 1’o’clock is visible in the TCAS, as is HOP694X at about 3’o’clock. Following are some more screenshots showing traffic as shown in RealTraffic and in the PSX cockpit. 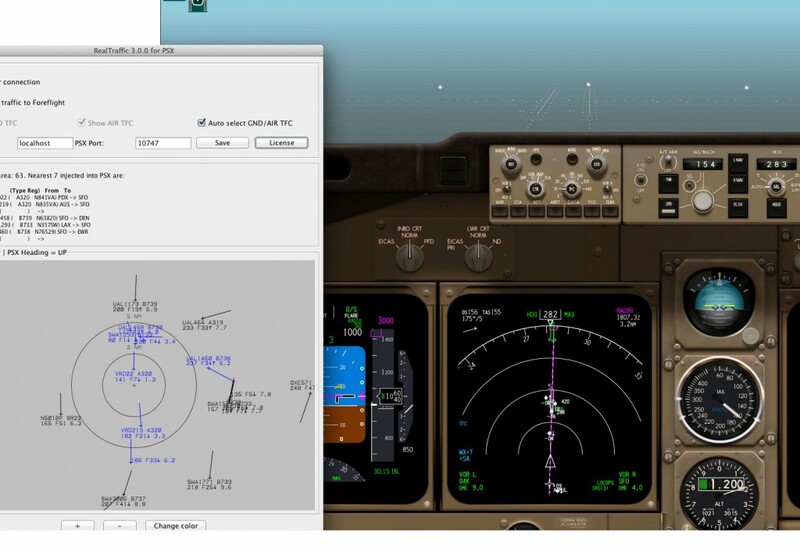 If you are seeing traffic in the RealTraffic application, but you can’t see the traffic in TCAS, make sure you have the display of traffic on your navigation display enabled by pressing the TFC button on the EFIS control panel. Descending into Paris. The real world traffic is visible both in the TCAS as well as the RealTraffic radar display. Approaching Runway 28R at San Francisco Intl. 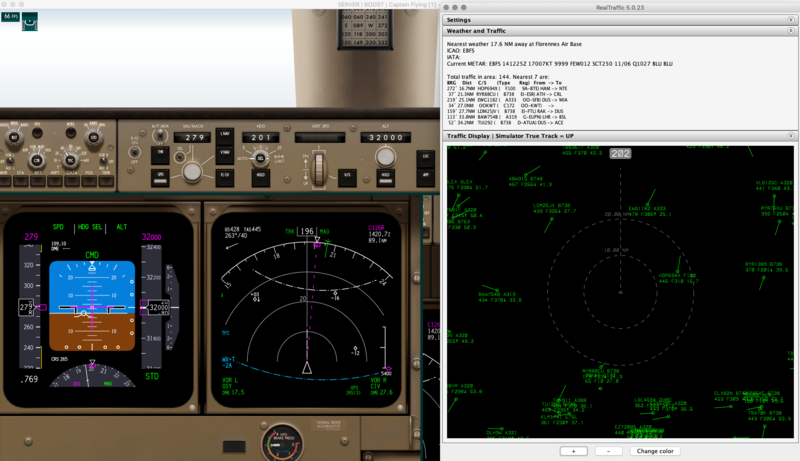 The real world traffic is visible both in the TCAS as well as the visual view. Testing the system by climbing into the approaching Etihad 183 (a Boeing 777W). Watch the TCAS RA on the PFD/ND to the right. – Fixed graphics bug causing high CPU usage when traffic window collapsed. – Minor network glitch fixed. – First release of v6. Now featuring navigation display. – Windows executable and setup are now cryptographically signed. – Added spotter mode: Allows operation without being connected to a flight simulator. 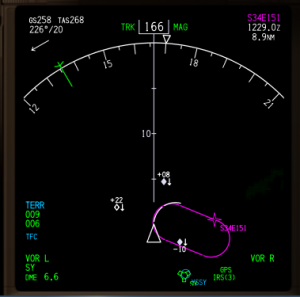 – Improved radar display now uses circles for aircraft targets. – Displays the current simulator true track. – Improved display of radar labels. – fixed nearest weather display (was missing). – removed time offset controls when feature is unavailable. – feature improvement: X-Plane is now supported as a position source (traffic injection is NOT (yet) supported). – feature improvement: More simulators will be supported soon. This requires modifications to the backend, which in turn requires changes to how the clients connect. A selection can now be made on which simulator is being used. – feature improvement: historical flight data is now available for up to 7 days in the past. – bug fix: makes callsigns/types in upper case. – java update: JRE 1.8_161 is now the standalone JRE. – bug fix: deals gracefully with corrupted ini files. – bug fix: fixed a null pointer exception when a QNH or air traffic queries timed out. – bug fix: renewed licenses can now be entered directly when starting the software with an expired license. – improvement: better debug information is now available when running in debug mode. – improved license error handling. – added console debugging output. – allows zooming into the radar map to 0.25 NM diameter. – fixed internal UDP socket bindings so third party apps can bind onto the same ports and network interfaces without blocking each other. – fixed network latency issue. – updated network traffic format. – added ability to disable PSX traffic injection. – a minor bug was corrected. – the windows program and setup executables are now cryptographically signed. – Make the individual sections collapsible. – Always persist settings on exit. – Fixes flipping traffic in PSX: Traffic now no longer makes sudden jerky motions in PSX. – Provides platform specific user interfaces including installers for Windows and OSX. – 10 minute time limit on the free demo. – AIR/GND traffic or automatic traffic selection is now possible. – Disable connection failure dialog box on autostarted reconnect. Now only displays when manually connecting. – Automatically reconnects if PSX disconnects, the network connection drops, or PSX is restarted. – First public non-beta release.